The shot in question occurs during the fireworks scene toward the end – if you’ve watched the film you’ll know exactly what I’m talking about. 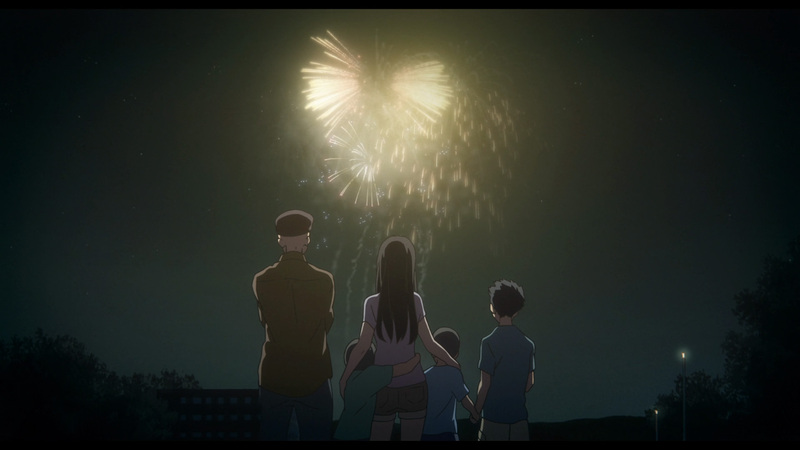 We see the secondary characters silhouetted against the explosions as they watch the lights, still save the explosions against the night sky. These shots don’t linger; they last for all of three seconds, giving you enough time to recognise the character and where they’re watching from. This, obviously, includes Ueno. Ueno is a deeply unpleasant character. 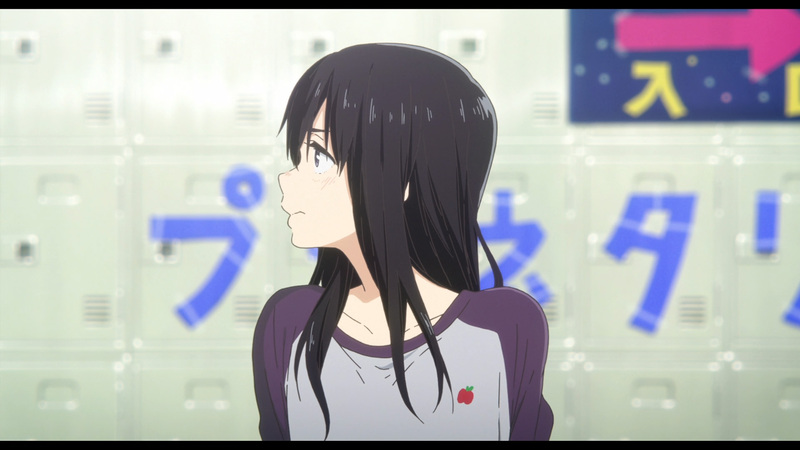 One of the first to turn on Nishimiya in elementary school (and one of the bullies to leave Ishida out to dry), she’s only shown to get worse as she gets older. She’s manipulative, she’s mean, she thinks little of anyone but herself – she’s a nasty sort who seems intent to drive a wedge between Nishimiya and Ishida for little reason. She is wholly unsympathetic. Guilt, envy or just plain cruelty, it doesn’t really matter why because there’s no excusing her behaviour – but there might be an explanation. And we get it when we see her during the fireworks. The bully is seen holding what we must assume are her three younger brothers, accompanied by an older man we must assume is her father – or maybe her grandfather. Note that there is no mother. And now everything makes sense. The oldest of four siblings, she’s had to play the role of her absent mother for who knows how long. She’s had to cook and clean and clothe them for years, support and care for them with no-one to support and care for herself, and to love them unconditionally alone unfalteringly. How quickly has she had to grow up? How much of her youth has she had to sacrifice for their sake? When we see her in a maid costume advertising the cat café she works at part-time, our initial reaction was amusement for how out of character it is – but maybe she desperately needs the money and has no better option? So of course she’s awful to her peers. I can’t blame her for lashing out, for finding some release for her frustrations, given her home life. How much stress is she under, how much responsibility is she juggling? School is an escape from that, and a place where the consequences for venting are that much lower. Of course her peers will get the brunt of it. And are we surprised that she’d target Ishida and Nishimiya specifically? In Nishimiya she sees someone who has also been dealt a bad hand but is nonetheless a happy and pleasant person that people like. In Ishida she sees someone who was as bad as her maturing past that and looking to turn things around. And the both of them are finding happiness in each other. In them she sees her own failures, she sees the person she could be but can’t. Her resentment of them is a projection of her resentment for herself. So I sympathise. It doesn’t excuse her behaviour for a second, but it’s understandable. Ueno is as tragic as the rest of them. Nobody knows this, though. We the audience are the only ones who get to see this, not the other characters. And that is hugely important. We get to know that she’s redeemable, but also that she hasn’t been redeemed yet. She never finds redemption in the film, which is fine because it wouldn’t have worked. Her problems are too complex to resolve that quickly, and the pain she’s inflicted won’t disappear so easily; to force it would have been too messy, too ugly, and undermined a lot of what the story was going for. Because everyone in this film is a bit of a mess. Nobody’s perfect, and nobody becomes perfect; they’re all flawed, but they’re slowly overcoming their flows and growing up; Ueno has difficult amends to make before she can find redemption, too difficult to depict in ten minutes. Ueno doesn’t get started on this, but thanks to this one shot she is granted hope. 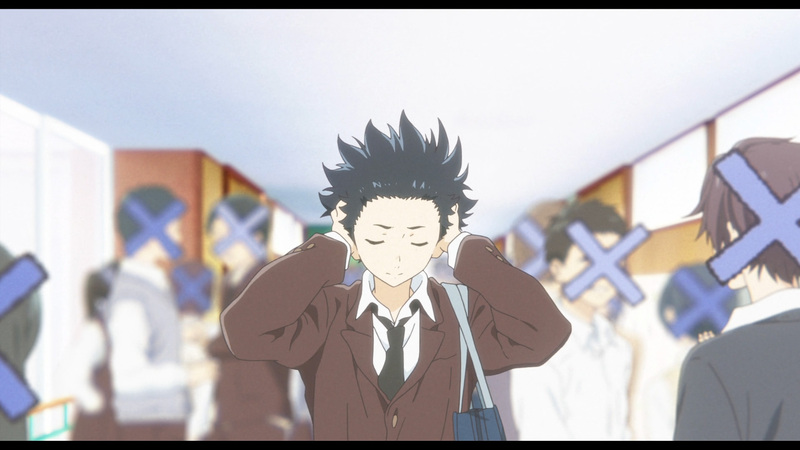 It’s subtle, yet speaks volumes about A Silent Voice’s intelligence and heart. And it accomplished all this in the space of three seconds. I always saw Ueno as a stand-in for where society is at today. Her treatment and bullying of Shoko and others isn’t as overt as Shoya’s but it’s still awful and systemic in nature, especially in the way she goes with the flow. Even at the end where she’s teasing Shoko with “baka” she’s again trying to fit in with the new system. This isn’t to say that she isn’t redeemable or can’t have feelings for others, etc. but it makes a lot of sense that any emotional development would happen in a quick shot like this or, presumably, offscreen. Societal pressure that causes bullying can’t be fixed overnight either, but inroads can be made one person at a time.